The Whole30 Challenge is rocking and rolling. Here is my Day 4 Recap. I woke up with an email from Whole30 saying that Day 4 is all about cravings. And I found them to be right. I ran out of vegetable juice so I started out the day with 2 hard boiled eggs and some grapes. 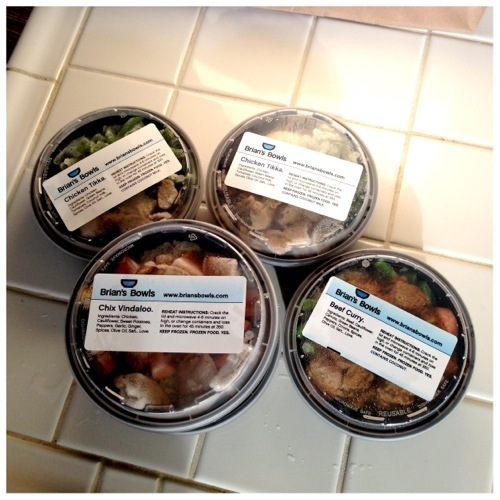 I went onto my doorstep to find a lovely surprise waiting for me – 5 Paleo and Whole30 friendly frozen food bowls from Brian’s Bowls. I have been ordering from Brian’s Bowls for over a year and a half now and they are great. Brian and Devika are so nice and friendly and always there to help me out. Their business is growing steadily and I couldn’t be more happy for them. If you live in Los Angeles, check them out at BriansBowls.com. I wanted to go home for lunch but I was too busy at work so I popped in a Brian’s Bowls Chicken Tikka in the microwave. It had chicken, cauliflower rice, and green beans. All their frozen meals are made fresh and most are paleo AND whole30 challenge compliant so these will be great for when I don’t want to cook. I did get hungry at around 4pm though and had some pistachios. I know the Whole30 program doesn’t recommend snacking but I figure if I’m snacking on nuts it’s not nearly as bad anyway. I don’t really get cravings anymore since I went gluten-free 8 months ago so I’m glad to not have to be fighting off cravings while on my whole30. For dinner we made leftover chicken coconut curry from the night before. It was just as good as I remembered it. Gosh I love that recipe. Think I want to make it again soon. I didn’t workout because I’m still getting over my sickness and wanted to take it easy. I did bake some kale chips before having dinner and they were so tasty. I love my food spicy so these kale chips are a great snack. After dinner my husband and I caught up on the final episodes of season 2 of Homeland. We’ve been hearing about how good this show is and finally got reeled in. It’s so good! Reminds me of a modern day 24. I also took a magnesium supplement to help me sleep. The Whole30 challenge recommends a supplement Natural Calm and I’m in luck because I have already been taking Natural Calm for the past 2 weeks. I took it before bed and slept really well. I think the combination of being 4 days comfortably into the Whole30 made for my first night of decent sleep. This is also the first day where I’ve started to notice that I feel a bit less bloated and slimmer. I think my water retention is going down. I was going to the bathroom like crazy even though I wasn’t drinking any more water than normal. Detox side effect? I think yes. Do you get cravings? What do you do to make them go away? Post in the comments and let me know!